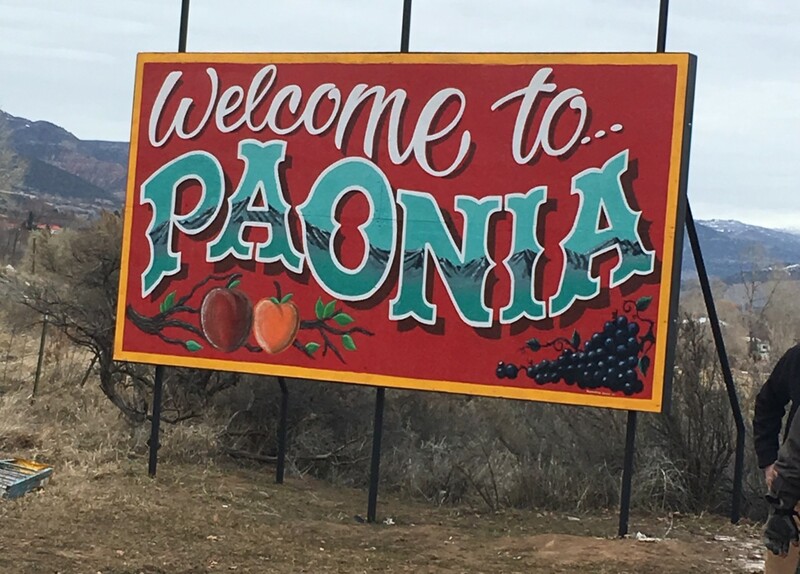 The Welcome to Paonia sign has gone up! Thank you all to the people who came out to help out during the installation of the sign. This sign has been in the making for some time now and has been a monumental effort. So many were involved in its creation, and we’re grateful! A huge thank you to: Brush Masters Getaway painted the sign; JJ Riggs built the wooden frame; Wesley Ewert of Climbing Vine Forge built the metal frame; posts were installed by Susie Kaldi Lowe, Jimmy Lowe, Mary George, John Mattox, Nolan Lightfoot, Spencer Lightfoot, Carolina Porras, Deirdre Morrison, and Maya Jensen; Lucanus provided steel pipes and drilled holes; Jimmy Lowe spray painted the steel structure; Plans for solar lights by Ed Eaton. We thank Anna Raith, Eddie Ogrondy, and their mother for allowing us to install the sign on their property Redwood Arms Inn.